Spring is in the air, and the light is getting interesting as the late afternoons draw in. 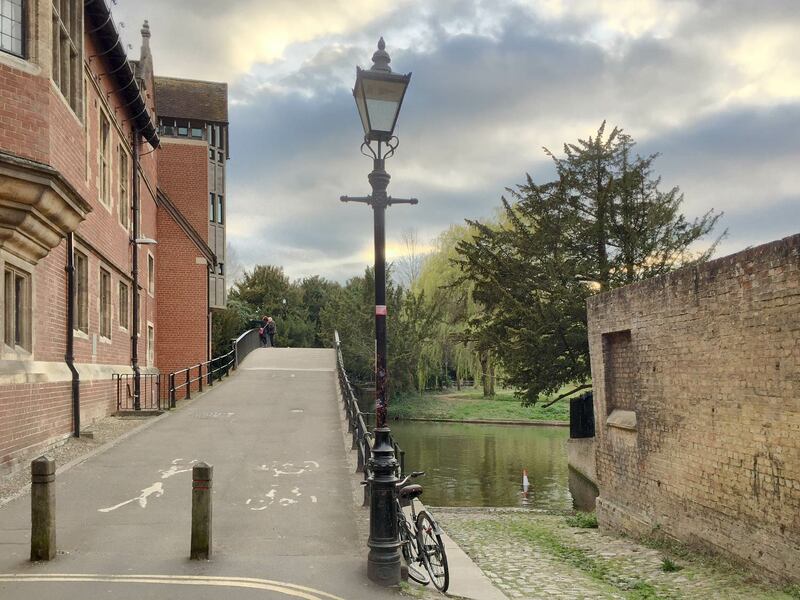 It is not hard in Cambridge to find a scene that could be from another time. The bulbs in the streetlights are electric, but from here they could be gas. I shot this with my phone and I can see the limitations – but then, should I be looking that hard that I miss the other qualities in the image? If it isn’t obvious, I am thinking about getting another camera – a smaller carry-around camera than I have currently. My carry-around camera is on the limit of ‘carry around’ and it has a fixed 35mm lens. That said, I would be lucky to find something that has its capability (see the photo at the end of this) in a small camera. Or should upgrade my phone? Or just make the image a bit lighter before uploading it? The problem with the Internet (yet another problem with the Internet) is the access to forums where people discuss cameras, including cameras in phones. I know, it is my fault for looking. If you are interested, take a look at The Online Photographer. They are currently discussing whether phones are ‘good enough’ now. This is a view this afternoon of Kings College from the river at the ‘Backs’, as the river side of the colleges is called. The sky is another sign of spring, I guess. And here is the shot from my current carry-around camera that I meant when I said it would be hard to beat it for what it can pull out of a scene. A lot of the shops in Bhaktapur in the Kathmandu Valley are set into the building, like here, and the shopkeepers sit back inside, relaxed on cushions. The plank of wood at the left of the photo is to help prop up the building. A lot of buildings were damaged on destroyed in the 2015 earthquake.